Sample is a 30 by 32 inch lap blanket in worsted weight acrylic yarn, but pattern can be easily adjusted to make a throw or full sized blanket. For lap blanket size, 400 grams/14 ounces/750 yards worsted weight yarn. For other sizes, see above chart. There is also a tutorial video. The beginning chain should be a multiple of 22 plus 17. Row 1: V-stitch in 5th chain from hook. Skip 2 chains, v-stitch in next chain. Skip 2 chains, shell in next chain. (Skip 2 chains, v-stitch in next chain) twice. ** Skip 4 chains, v-stitch in next chain, skip 4 chains, v-stitch in next chain, skip 2 chains, v-stitch in next chain, skip 2 chains, shell in next chain, (skip 2 chains, v-stitch in next chain) twice. Repeat from ** across to end of chain. Turn. Row 2: Chain 3, skip first v-stitch, (v-stitch in next chain space) twice, shell in next chain space, (v-stitch in next chain space) twice. ** Chain 2, skip next v-stitch. In next chain space (1 sc, 4 ch, 1 sc). Chain 2, skip next v-stitch, (v-stitch in next chain space) twice, shell in next chain space, (v-stitch in next chain space) twice. Repeat from ** across to end, ending on next to last v-stitch. Turn. Row 3: Chain 3, skip first v-stitch, (v-stitch in next chain space) twice, shell in next chain space, (v-stitch in next chain space) twice. ** Skip next v-stitch and chain 2. In chain 4 space work v-stitch. Skip chain 2 and next v-stitch, (v-stitch in next chain space) twice, shell in next chain space, (v-stitch in next chain space) twice. Repeat from ** across to end, ending on next to last v-stitch. Turn. Last Row: Chain 3, skip first v-stitch, (v-stitch in next chain space) twice, shell in next chain space, (v-stitch in next chain space) twice. ** Chain 2, skip next v-stitch. In next chain space (2 sc). Chain 2, skip next v-stitch, (v-stitch in next chain space) twice, shell in next chain space, (v-stitch in next chain space) twice. Repeat from ** across to end, ending on next to last v-stitch. Fasten off and weave in end. 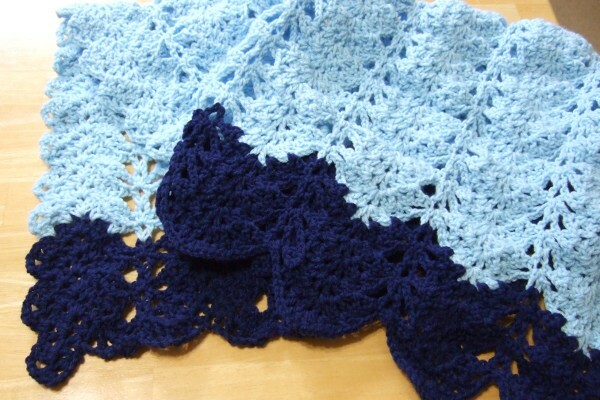 The blanket can be made in a solid color or can be made with any number of color changes. Color changes should be made between row 2 and row 3. The best way to make a color change is to finish all but the very last pull through of the two loops of the last double crochet of a row. Cut yarn with a few inches of tail and join with new color next to stitch. Pull new color through last two loops. Weave in ends. There is a chart available of the first two rows. 8/14/15 – added link to No Beginning Chain version. I’ve been looking for a pretty baby blanket pattern. This just might be the one! Thanks for posting it and the pattern. It’s really lovely. Love this pattern ..Thanks for sharing. I am sooo glad I found your site thru Bev Mathesons site! Thanks Bev. Thank you for sharing this pattern, it is very pretty. This will be my next project; it will be for my great-daughter that is on the way. Love your pattern! I am fairly new to crocheting. I am having trouble with Row 2. Are the various stitches in row 2 susposed to line up with row 1? Would it be possible for you to send me a diagram of the pattern. I really want to make this for my sister for her Birthday next month. I appreciate any help you could offer. Many thanks, Elaine. It’s not great work, but I did put together a chart of the first two rows. I hope it helps. I’m having trouble with Row 3, where it says skip next v stitch and chain 2, In chain 4 work space….So I need to chain 2 and skip the next v-stitch and at this point I should already be at the first chain 4 work space from row 2? After the shell, you will make two V-stitches then skip a v-stitch and skip the chain 2 that is before the chain 4. Then make a v-stitch in that chain 4 space. So you won’t make any chains between those v-stitches. Sorry for the confusion. Hi, I’m really loving this pattern. I’m a little confused right at the end of row 2 though.. I ended up with a V stitch with nothing in it and the pattern says to turn work. Would you be able to clarify this for me at all? Yes. There will be a V-stitch at the end of each row with nothing in it. It actually will create a very pretty scalloped edge as you progress. I am leaving a blank v stitch at the end of each row, so it seems to me that each row is getting shorter than the one before. Does the chain 3 count as the first v stitch? It might be really helpful to have a chart for about 5 rows just so I could better visualize. The shell adds back the v-stitch you are dropping at each end of each row, so the number of stitches stays constant per row. I made a chart, and it makes it look like the rows are getting shorter, but it’s just that it’s more scrunched up because I didn’t draw it very well. If you can look past my poor drawing skills, hopefully it will help. I had to come back and read the comments because I thought to myself there is No way this is right. But if you say so….. This is beautiful. I can’t wait to make it. Thank you. This is beautiful! I don’t normally do v-stitch or ripple patterns, but this one is a must do! Usually when I use patterns, I adjust them to my own taste. This one won’t need any of my ‘touches’. I plan to do one for my grandbaby due in October, and one for my daughter, so she’ll have one to snuggle under while the little one snuggles in his/hers. Thanks for this pattern. love your patterns, your stitching is beautiful too. the variations on the ripple make the whole the new and fresh. I am so happy I found your blog! Thanks so much for sharing this beautiful pattern! Beautiful pattern. Thanks so much for sharing. We have a gal at church that just announced she is pregnant. This looks so pretty I think I might make it for her. Thanks so much for sharing. Living in So. Fl. where it usually is warm, I think that the worsted wt. would bew too heavy. Do yo think it would work well with a Sport wt. yarn and a larger hook or smaller hook then the one specified. I would however,make it as it is for my kids who live in a colder climate. Thanks for any information. I am eager to get started. This is a very versatile pattern. I think it would work well with any weight yarn and different hook sizes would be fine as well. Really pretty, can’t wait to try it. It says it’s easy we will see. Thanks for the pattern. The shell has 4 dc and 3 chain spaces. On the next row, the v-stitch on either side of the shell will have a v-stitch in it, the two outermost chain spaces of the shell will have a v-stitch, and the center chain space of the shell will have a shell in it. I just learned to crochet a ribble afghan several months ago. It took me many weeks to complete it until I could get even rows at each end. Learning to done so, I realize how sastifying and easy the Chevron pattern can be! I am ready to learn something more complexed and this lacy pattern may be just the thing! Thanks… MERRY CAT CRAFTS. I would LOVE to know HOW to increase teh size of this throw to make a full-sized blanket/afghan — I just don’t know how many chains to add. Could you help me out? It’s my dream that some day patterns will have this as part of the instructions as I like to make afghans much larger than the usual 43 or 45 by 56 or 58. My family likes to snuggle in and wrap up , so larger sizes are needed but it’s not that we’re huge people . . . . Thanks for any assistance you could give me. LOVE the pattern, by the way. Ohhh, DUH. If I had read a little further into the pattern, I would have seen the instructions for increasing. I NEVER would have figured out how many to increase it by that way — 22 plus 17 — That’s incredible. Can you tell I’m not too familiar with some of the crochet techniques? LOL. Thank you AGAIN. Thanks so much for the lovely pattern! I had to rip out part of the second row, after looking at the chart. Thanks for the chart it was helpful. I’m on the last row at the end it says ‘turn’ instead of fasten off. If I turn what do I do then? I apologize! I have fixed it in the pattern now. At the end of the last row you want to fasten off. So sorry. I have crocheted all my life and I have tried to follow this pattern 3 times and have ripped it out 3 times, it is very confusing, is there a way to simlify it? it is a beautiful pattern, but I am totally confused. I really want to help because I think once you get the rhythm of it, you’d find it to be simpler. Could you give me more details about what is confusing? It’s also wonderful how you take the time to answer each question. Thank you for a lovely pattern. I “fixed” the ends on the 1st afghan so I ended up with a straight edge. You are right the scalloped edge is much prettier. I used dk weight yarn(3). This makes up fast for beautiful baby blanket/afghan. i just finished this afghan. love love love it. i wanna hang it over the foot board of my bed. I want to make this afghan but in a larger blanket size. How do I determine amount of yarn to purchase to do so? I wanted 40″ X 50″ afghan. Because of the repeat, I can’t hit exactly 40″, but I did calculate the possible sizes on either side of 40″ at a 50″ length. For 38.75″x50″, will take 27.46 oz/1,428.88 yards of yarn. Begin with chain of 193. For 43.25″x50″, will take 30.59 oz/1,591.76 yards of yarn. Begin with chain of 215. Hi how are you everyone. I will try to make a video soon. I need to buy one more piece of equipment to be able to make a little bit better quality video than some I’ve tried to make. I’m sorry it took so long to get the video made. Hope it is helpful. I absolutely love this pattern, and appreciate the fact that you take the time to answer everyone’s questions. Hi! I am making this as a present for my best friend and she would like a 52 Length by 72 Width, could you please help me figure out how much yarn I would need and what my beginning chain would be? Do you really want to make it wider than long, or did you mean 52 wide and 72 long? That would have a beginning chain of 259. This size would take 53 ounces of yarn or 2,760 yards. If you really do want it wider than long, the 72 inch width is harder to hit because of the repeat. You can get 70 inches wide with a beginning chain of 347 and 74.25 inches wide with a beginning chain of 369. What a beautiful pattern! 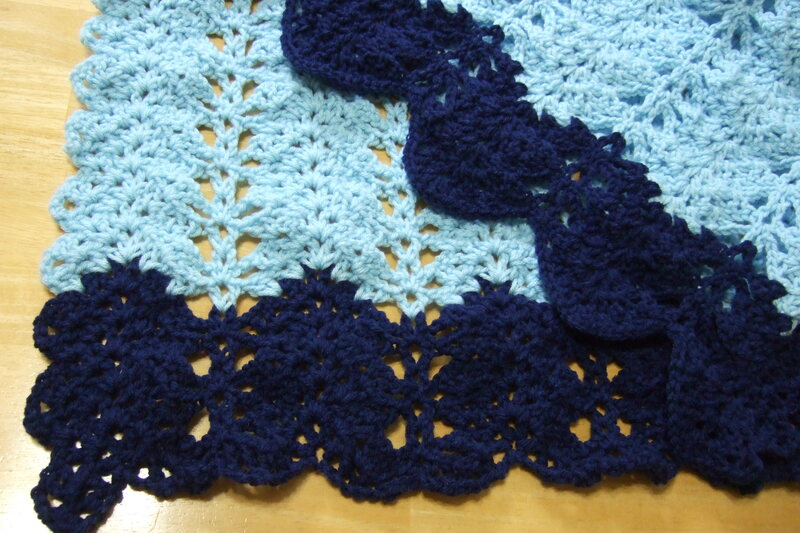 I’ve been looking for a variation on a Ripple that is lacy, but, heavy and works up quick. With the right colors, this could be for a man or a woman and I’d love to try it as a baby afghan! I know there aren’t many guys that crochet, but, when I got injured as a youth, the woman that cared for us then taught me to crochet and make things for the missionaries to keep me from going stir crazy! After I recovered from my injury, I realized that not only did I enjoy doing it, it was relaxing, kept my hands occupied when I was sitting and watching TV or passing the time on a trip and etc, but, I could create some incredibly beautiful gifts, keepsakes and personal items. I am constantly looking for new patterns. But, I am looking for a patter for a sweater/jacket that was made for a friend of mine by her mother that has since passed away. I know the basic pattern is made up of single crochet granny squares that are put together. IF ANYONE has a pattern like this, I’d love to have it and the way to figure out different sizes of the same pattern. It had NO BUTTONS, and 3/4 lenght sleeves and was finished off with a continuous single crochet border around the ends of the sleeves, and around the collar, front sides, and the around the bottom border. Can anyone help me? Thanks for a great pattern, by the way! There you can ask folks about the pattern you are looking for and they may be able to help you. What a wonderful new site! I’m so delighted to find you and your beautiful,unusual projects. Most of the time I’m bedridden and the sheer level of extreme pain fills my days. Last year I taught myself to crochet with the help of youtube tutorialS. Crocheting makes me feel productive, fills my burning need to be creative, and takes my mind off my pain. Your patterns are so unique and yet I think I can make the lacy v-stitch ripple afghan if I watch your tutorial enough times! Please continue to create! I love everything you’ve done. You are a gem–so patient and kind to share all this great info and to answer all the questions presented to you! Thank you— i am anxious to try this pattern!How do I add you so I can follow your posts? In your pattern you state multiple of 22 plus 17, which equals 39. If you divide that into the number of stitiches ie: 39 into 193 = 5 .5 x 39 equals 195 stitches. I have started this at least 3 times and when I get to the end and turn it doesn’t work out right. Can you help me? There are 22 chains in the repeat with 17 more chains for the stitches on either side of the repeat. For the 193 beginning chain, that is 8 repeats, so 22×8=176, then add 17 more for the extra stitches on the ends for 193. Are you starting with 193 or 195? It always seems to me that I have more trouble working a simple pattern than a more complicated one, as I am 83 and have been crocheting for a number of years…..
Crazy cool to find your site from allfree!! I just watched this tutorial of yours and this is so neat because I’ve had such a hard time trying to get my ripple to ripple! Thank you! I gave up even trying to ‘ripple’ anything about 15yrs ago and after seeing and hearing your logic…I think I have it! Do you have any other tutorials I could find? You’re the very first person I’ve writen on anything Yarn! Thank you again! I love the beautiful lacy look to the classic ripple design. I see the beginning chain adjustments for larger afghans, but I do not see the yarn requirements for them. How do I figure the needed yardage for the larger sizes? Thank you for your help. That is one of my older patterns that didn’t have a chart. I added a chart with the yardage for the other sizes. Thank you. This helps so much! Do you have a “multiple” for this pattern? I make prayer shawls, and this would be a lovely pattern for one! Thanks! I used this pattern with six rows of black and 6 rows of white…….the colors of my daughters bed spread and it came out gorgeous. I was not sure of the design but it is lacy and very elegant. Thank you for letting me use this pattern. I am very well pleased. Lacy V-stitch Ripple Afghan … PDF Pattern problem. Love the pattern design, however, when trying to open the Chart at the bottom of the PDF File it only offers the following option. Did get a copy of the chart from your BLOG so I’m OK, just thought you would want to know about it. That sounds like the interface that creates a PDF. I have been looking for a pattern for making a Christening blanket, all in white, and this one is really pretty. What are the average “dimensions” for a baby blanket??? Would I follow the directions for extra small or small??? I appreciate any and all suggestions. Thank you so much for sharing your pattern and your talent. I did a little looking around and it looks like Christening blankets are 34″ square or 36″ square. I just finished the afghan, it is really pretty (Only took 2 days). Never could have figured it out so quickly without your tutorial, thank you! I love this pattern .would it be suitable for making a queen size bedspread. This is really a beautiful pattern. I love the dark edging. I’ll really enjoy making it. Why is one end of Afghan in the dark edging left looking unfinished when the opposite end curves so perfectly? Am I misreading, making a mistake or just missing a step? It is such a lovely pattern and I am tired of starting and frogging so I am turning to you for your input. Please answer me as soon as you can. I will be waiting impatiently as I would really like to get this Afghan stated. Some ripples look more similar on the two ends than this one. It has a smaller ripple to the beginning edge and the deep dip on the ending edge. I am ready to start this project,would Caron Simply soft be suitable? Absolutely. I’ve made a lot of afghans with it and know it would work great for this. Mama- I really liked this V-stitch ripple. Simply beautiful. I also love that you have now included the video. Consider a written transcript of the video for the hearing impaired. Might also help other folks. Thank you for this pattern. I just started it last night and I’m cruzing thru it. Just had one question though. How many rows would you say for the “medium” size blanket? I have a couple colors that I want use in the one blanket and I’m trying to figure out about how many rows to do of each color. I calculate about 63 rows. Thank you for another beautiful pattern. It seems as if all the afghan patterns I either keep or make up immediately comes from you and they all turn out wonderful. this is an absolutely lovely pattern – I’ve been waiting for the perfect blanket for my granddaughter who just turned 1 year old and now I know what pattern it will be. It’s a perfect lacy, delicate, girly stitch that will go nicely with the pinks/purples/pastel yarns I already purchased for it. I anticipate this will be one of the first few heirlooms she’ll collect. Thank you! This is so pretty! Thank you very much!! I’ve been looking for easy afghan patterns because I’ve begun kinda a personalized ministry at our local VA HOSPITAL.I had to get an IV infusion,for osteoporosis,and had to do the procedure in the chemotherapy unit.Since I always keep something going with me,I realized how the patients were sitting alone,some having no one with them,and being a veteran more than likely they are alone.I asked the charge nurse if I could bring afghans and she could distribute,she cried.Good answer.now I’m attempting to make as many as possible.I gave my first last Friday. I love this pattern! I’m a very picky crocheter when it comes to blankets for the younger kids in my family especially my two little ones, they love when I make them blankets and my father had an awsome idea that for Christmas this year we make the presents cause he believes it’ll mean more, I totally agree and I can’t wait to use this pattern! The video helped so much thank you for taking your time to do that! That’s correct. After several rows you will see the ripple that develops on the sides. It makes it’s own lovely edging, so when you are done you are done! would so much like to learn how to do this one. have torn it out twice now. your video is much too fast and you don’t stop and lay it out so that we can see what it is supposed to look like. don’t mean to sound critical but really would like to learn how to do this. I do apologize for that video. You are not the first to complain about it. I want to redo it, but don’t have a good video setup right now. O.k. after watching your video over and over again and comparing it to your directions I have finally figured out why it is so confusing. your directions are saying to v stitch in next chain space when what you should be doing is v stitching in the v stitch. Row 2: Chain 3, skip first v-stitch, (v-stitch in next chain space) twice, shell in next chain space, (v-stitch in next chain space) twice. The first v-stitch is made in the ch sp of the second v-stitch of the prior row. The second v-stitch is made in the first ch sp of the shell. The shell is made in the center ch sp of the shell. A v-stitch is then made in the third ch sp of the shell and then a v-stitch in the next v-stitch. At the “valley” you will always be skipping the two v-stitches on either side of the valley. I hope that is helpful. I’m sorry it has been so much trouble. Once you get going on it, it will just fly. Thanks for the pattern and the tutorial videos for the blanket… I am going to make for granddaughter for Christmas gift… I plan to use her favorite colors in rows to create interesting color scheme too… It looks like you used 3 repeats of the pattern rows for the dark blue border…is that correct? Yes, three repeats which is 6 rows. I got the first two rows of your afghan it is great but having a hard time doing row 3. Would it be possible to have a picture o how it is suppose to look.. when I started it after the chain 3 it says skip the first v stitch thebn it says v stitch in net chain space twice do you go to the nextv stitch? then a shell in next chain space well that next chain space is the2 chain do I do the shell in that then the v stitch in teh 4 chain? SO confused can you send a picture,. I’m sorry it has taken me so long to respond. Here is a picture that shows the beginning rows and one of the sides. I am making this gorgeous afghan for my mom for Mothers Day and just wanted to say how much I love it and how beautiful it is. I have been crocheting for 25 years and did find the pattern a bit confusing at first but once I got the hang of it the whole thing started working up quite quickly!! Thank you for sharing! love to watch you do this pattern,being somewhat sight impaired I am goin to make an afghan from your pattern with the help of your tutorial. I really enjoy your patterns. I like how you give the amount of yarn or skeins for each size. Your patterns are very easy to read. Thank your for sharing your pattern. Can I use the chainless chain for this afghan? How many rows before you change the colors like you have done in your example?Statrtinting with a chain of 281. Making one for woman who lives in midwest U.S. Usining Micchaels Loops & Threads Super Bulky 6 Thinkinking about using Homespun for the top. What is your opinion. The main color is varigated want to use a solid color on top, But Michaels doesnt have a solid that suits my fancy. Theu carry a white or off white but the woman has a cat. Any suggestions? I made six rows in the darker blue at the top and bottom. If there isn’t a solid that has the look you’d want with the variegated you have, I think that it would be fine made entirely of the variegated. I’ve seen some finished blankets of this pattern done entirely of variegated on http://www.ravelry.com. On your instructions you say to you say on Row 3 skip next I stitch chain 2 in Cain 4 space you work a v stitch skip chain 2 and work a stitch repeat from ,++++ across to ending on to last v stitch turn. I’m following the directions in the video, but I demonstrate the technique explaining it different ways. I assume that if someone is watching the video they need directions explained differently than the written pattern. What is probably confusing in the written directions is what is being skipped and what is being made. The part you are quoting – the v-stitch and the chain 2 are both going to be skipped. Then you will make a v-stitch in the chain 4. You then skip both the chain 2 and the chain 1 of the v-stitch and make a v-stitch in the next v-stitch. I was wonderining what a single foundation crochet woiuld look like at the begiginning instead of a normal chain stitch? My concern would be that it would pucker after adding a few rows of the pattern since the pattern ripples. I tried the new pattern no beginning Lavy V Stitch and my shells didn’t match up so I went back to the original pattern that you came out with. The afghan I am making is a very big one 281 loops the problem I want to know is where is the link that you talk about in the video? I am having problems about when do I stop skipping the four holes and my using yarn that is like homespun yarn that is not homespun but comes from Michiaels. I’m sorry you gave up on the new pattern. I think it would be a lot easier with that type of yarn. It is so hard to find chain stitches with that kind of yarn. I guess my philosophy on the videos is if the written instruction format had appealed and worked for someone, they wouldn’t be watching the video, so in the videos, I try to explain the pattern in a different way. The link I refer to in the video is just the pattern link that you already knew about. The basic idea of this pattern is that the ripples peak at shells of 4 dc separated by chains, in between the peaks and valleys are two v-stitches, and the valleys are formed by alternating row patterns of a v-stitch and the (2 ch, sc, 3 ch, sc, 2 ch) which is worked in the prior row valley v-stitch. For the ripple to ripple, the v-stitch on either side of the valley are skipped and instead v-stitches are worked on either side of the shell. If you have a question about if something is working correctly or wondering where to go next, send me a picture so that I can diagnose the issue. I really love your blanket. I just need some help with my first row. When I came to the end, I could only make one v stitch instead of two stitches. What can I do?? If you’d rather not rip out and restart, a quick little cheat you can do is to make a double triple crochet into the last chain. Chain 1 then make a double crochet into the side of the double triple crochet at about the center. The double triple will be the length of a double crochet and a couple of chains. So this can replace that last v-stitch and keep you going. I hope to have some sort of e-mail alert in the future, but don’t currently. I post alerts of new patterns on Facebook and I have a designer page on Ravelry. I haven’t been able to make videos for a while so haven’t been able to remake this one slower and clearer. I do think there is a purpose for explaining it differently than the written pattern. I’m doing the same thing but explaining it differently. I assumed that someone would watch the video if they didn’t understand the written instructions, so I was explaining it a different way. I hope to someday be able to make videos again and this one is a good candidate for a redo. This is so beautiful and elegant. I love the colors. I’ve never used this stitch but I’m going to try once I finish my other projects. You do great work. This is absolutely gorgeous. I can’t wait to make it. Thank you for sharing the pattern and for taking g the time to answer everyone who had a question. Love your pattern! Took a minute to get the hang of, but only because it’s so different than what I’m used to! Took a second to make myself forget how patterns always are and just do what this pattern was telling me to do!! Thank you for sharing such a beautiful and unique pattern with us! For a queen sized afghan, you want it to be about 90 inches across. Start with 457 chains. I absolutely love this pattern. Thank you for sharing it! Your video helped tremendously! I suggested the place to make the color change as my personal preference, but you are correct that on this pattern, it really isn’t that crucial. I’d love to see pictures! You can e-mail them to me at mama at thetucker dot com. If you’d like to share them for all the readers to see, I can post them as a blog post. Correct. Sorry I didn’t clarify that. I have a project on my to-do list to make that more clear in my patterns like this one and other similar ones. What are the chain count for a twin size Afghan? Ty in advance! Start with a chain of 369. This will be approximately 66″ wide. All of these patterns are beautiful. I justlove too crochet. This doesn’t look like the same afghan I saw on Pinterest that had your site name on it. It was a different color all together and said it looked like it had butterflies in the stitching. Do you have that pattern, or if not, how do I get it? It was cranberry and mauve as I recall without looking at it again. I want to thank you so much for this pattern! I have had no trouble in making it. I am just about finished now It is really very simple to work up. I have crocheted for a number of years and I have encountered many patterns that were difficult to understand…but this was not one of them. Again, thank you! Just came across your patterns and wanted to send you a BIG thank you for sharing your talents with others. thankyou this looks like it will be fun to make. very pretty. Thank you so much for this pattern! I’ve been looking for a good pattern for a lightweight throw that’s suitable for summertime, and this is perfect! I’m using one of the Yarn Bee Sugarwheels (from Hobby Lobby), and it’s turning out to be very pretty. I was worried that it would look bad if the color didn’t change right at the end of a row, but it’s barely noticeable and actually looks kinda cool when it doesn’t transition perfectly. I would highly suggest any self-striping yarn for this pattern. It’s an easy way to have multiple colors without having to change yarn at the end of rows even though this pattern allows for easy transitions. Thanks again for the great pattern! All the extra charts and videos were very helpful in getting started! The picture here does not go with the instructions given. How do I find instructions for the one pictured? The instructions go with the picture I have on the page with the instructions. It may be that you came from another page with a link to my pattern, but that page featured a different picture. I’d have to know what page you came from to know. Love the colors you used. Do you remember what the colors are? The lighter color is Caron One Pound Sky Blue. The darker is Red Heart Super Saver Soft Navy. I would like to see the pattern for the afghan, that looks like butterflies—using white, pink, magenta and purple yarn—please? I don’t have one like that on my site. Perhaps the picture was in an e-mail or site with links to other pages. If you remember where you found my link I may be able to trace down the one you saw. I’ve been looking for the butterfly afghan pattern, as Nancy mentioned. Pinterest has it and when I click on it, your sight opens up. But the pic says “stitcheryprojects.com” and that’s it!! I’m trying to copy the pic to send you! It’s beautiful! I think it is this pattern. It looks very different because of being made with different solid color stripes and a smaller gauge yarn in that picture. Thank you! I’ll have to try it in the solid colors!